Donald Trump wants Wilbur Ross, the billionaire investor tapped for Commerce secretary, to oversee his trade policy, in a controversial move that could spark a battle between the incoming administration and Congress. Trump has agreed to give Ross, a close friend, responsibility for handling one of his signature campaign issues, the Financial Times has learnt. The move, which would cut the influence of the US trade representative (USTR), would boost the role of Commerce secretary, traditionally a weak cabinet position. But it could face resistance in Congress where there has been opposition to similar ideas in the past. “Secretary Ross will be our administration’s leader on setting many of our trade priorities,” Jason Miller, the Trump transition team spokesman, confirmed when asked by the FT about the move. Ross was one of the main architects of Trump’s “America First” trade policy. In interviews since the election, he has continued to be the most vocal advocate for a wholesale rethinking of US trade policy. His role is set to be formalised once the new administration starts in January, according to the Trump transition team. Trump will still appoint a USTR head. But the president-elect has backed away from his campaign vow to bring all of the government officials involved in trade policy into an “American Desk” at the commerce department. One person familiar with the shift said Ross would determine trade priorities and that the USTR would be required to implement them. Miller said the transition team was “still determining the exact lines of responsibility between Commerce and USTR”. 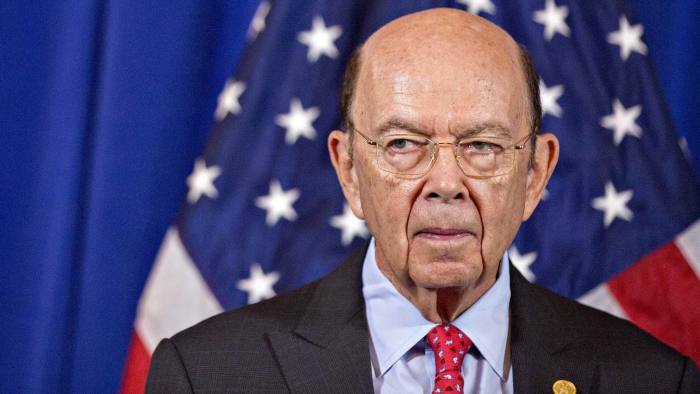 But he said that 79-year-old Ross would play a much larger role on trade policy than previous commerce secretaries because of his relationship with Trump and his role shaping the president-elect’s trade message. He declined to comment on whether the Trump team had discussed the move with Congress. Ross has been an outspoken critic of past trade agreements and has argued that the US could better use its leverage as a major consumer market to force countries to buy more US goods to help narrow the trade deficit. At a campaign rally in October, Trump pledged a “major reorganisation of our bureaucracy” to make Washington’s approach to trade more efficient. Congress has for decades aggressively guarded its constitutionally mandated oversight of international trade. Sandy Levin, the senior Democrat on the House ways and means committee, which has jurisdiction over trade, said a reorganisation would be an unneeded distraction for the incoming administration. By handing Ross oversight over trade while maintaining the administrative divisions, Trump may still provoke a fight with the House and Senate committees that have responsibility for trade in Congress. The two key committees — the House ways and means committee and the Senate finance committee — also have jurisdiction over tax reform, which is another priority for the Trump administration. Gary Hufbauer, an expert on US trade policy, said any effort by the Trump administration to have Ross lead on trade would mark a significant departure and face opposition. “Even doing it informally will create some friction with the congressional branch,” he said. The US Constitution gives Congress the power to regulate trade. The legislature regularly delegates that authority to presidents, doing so most recently in June 2015. But it also has rejected repeated attempts by presidents to fold the office of the USTR into the commerce department or otherwise reorganise the bureaucratic structures. Since the position was first created in 1962, the USTR has been a part of the president’s executive office, in a move that gives it additional authority internationally. It has a reputation for being a lean operation, in stark contrast to the sprawling commerce department, which has some 47,000 employees around the world. Canadian officials say billionaire Wilbur Ross, the nominee for U.S. commerce secretary, has indicated to them that a formal-notification letter to open negotiations on NAFTA will be sent to Canada and Mexico within days of Friday's inauguration of President-elect Donald Trump. The U.S. wants to discuss country-of-origin rules, which govern how much content from outside NAFTA a product can contain and still qualify to be shipped duty-free. Country-of-origin rules affect automakers in North America. Under NAFTA, the country-of-origin threshold for preferential treatment for assembled vehicles is 62.5 percent. The Trump administration is expected to take a harder line on exactly what can cross the border duty-free. The U.S. also wants to discuss independent dispute tribunals, which the U.S. views as unaccountable and says give too much power to Canada and Mexico. However, Ross said in October 2016 that “in the case of the trade between the U.S. and Canada, it is relatively much better-balanced than is the trade between the U.S. and Mexico” so “Canada doesn’t have a lot to fear” with Trump as president. Foreign Affairs Minister Chrystia Freeland has already contacted Ross about NAFTA. When she was Minister of International Trade, Freeland helped seal the Canada-European Union Comprehensive Economic and Trade Agreement (CETA) in late 2016. She was recently named Minister of Foreign Affairs during a cabinet shuffle, but remains active on the NAFTA file. “The Minister looks forward to working very closely with the new U.S. administration, and with the United States Congress on issues of mutual interest, including trade and investment in various sectors,” said Freeland’s press secretary Chantal Gagnon on Tuesday. Gagnon said Canada has also discussed Trump’s proposed “border tax” with his transition team. The Republican shaping plans for US tax reform has vowed to push ahead with a controversial levy on imports, saying it is vital to fixing the current “backward” system despite the opposition of foreign countries and American importers. Kevin Brady, the chief tax policymaker on Capitol Hill, launched a robust defence of his proposal to tax imports and sought to tie it to President Donald Trump’s “America first” economic agenda just as the new president appears to waver on the idea. The plan to penalise importers and incentivise American exports has emerged as the most contentious part of the biggest proposed overhaul of the tax code in 30 years, a process that begins in Mr Brady’s Ways and Means committee in the House of Representatives. Today foreign competitors “adjust” their taxes at their borders by adding taxes to American-made products and taking taxes off their own, he said, but the US did not. By killing that “completely backwards” feature — which he would do by not letting US companies deduct import costs from their taxable income — Mr Brady said he would eliminate the price advantages of Chinese steel, Mexican cars and foreign oil. But he faces a fierce battle over his plans. Big importers including retailers, apparel makers and the billionaire Koch brothers have united against the proposal, arguing it would cripple businesses that cannot source their products in the US and force them to raise prices for consumers. The proposal will need Mr Trump’s backing to prevail, but the new president has created considerable uncertainty over his position at a time when his administration’s key policymakers on tax have not yet taken the reins. But he backtracked soon afterwards, telling the Axios news service that the report did not accurately reflect his views and that the border tax adjustment was “certainly something that is going to be discussed” in White House negotiations with congressional Republicans. Mr Brady said: “We’re having very constructive discussions with the Trump administration. They do want to go bold on tax reform. They do want to level the playing field so our American companies and workers can compete anywhere in the world and especially here at home. “Their economic team is active on a lot of these issues right now. I’ve been incredibly impressed with how deep a dive the current team did and [how deep] the president has gone on taxes”. The border adjustment plan would be good news for US exporters because export revenues would be excluded from company tax bases, handing them an effective subsidy. The Trump administration floated a 20 percent tax on imports from Mexico to pay for a wall along the southern U.S. border, a plan revealed hours after Mexican President President Enrique Pena Nieto canceled a meeting with Trump. "When you look at the plan that’s taking shape now, using comprehensive tax reform as a means to tax imports from countries that we have a trade deficit from, like Mexico, if you tax that $50 billion at 20 percent of imports," White House Press Secretary Sean Spicer said. "By doing that we can do $10 billion a year and easily pay for the wall just through that mechanism alone." Spicer spoke to reporters aboard Air Force One as President Donald Trump returned from a speech to a congressional Republican retreat in Philadelphia on Thursday. Spicer didn’t explain how such a tax would work or how it would affect U.S. consumers and companies. Asked if the tax could be applied to other countries, Spicer said the administration is "focused on Mexico right now." Later, Spicer summoned reporters to his office and said the tax was only one idea to finance the wall, and that its economic impact would have to be examined. The conflict between Trump and Mexico escalated over a 24-hour period after Trump signed a directive Wednesday to initiate the process of building the border wall. Trump’s border plan rapidly exploded into a showdown that threatens one of the world’s biggest bilateral trading relationships. Mexico’s currency has plunged almost 14 percent since Trump’s election on concern that Trump will renegotiate or scrap the North American Free Trade Agreement. After Pena Nieto said in an address Wednesday that his country would refuse to pay for a barrier on the U.S. southern border, Trump blasted him with a tweet Thursday morning. “If Mexico is unwilling to pay for the badly needed wall, then it would be better to cancel the upcoming meeting,” Trump wrote. The border tax Trump floated wouldn’t directly be imposed on Mexico but added to the cost of products as they crossed the border, translating into either lower profits for companies that import goods such as Ford Motor Co., Wal-Mart Stores Inc., Target Corp. or higher prices for U.S. consumers who buy the products. "Mexico doesn’t pay for the wall," said Jared Bernstein, a senior fellow at the Center on Budget and Policy Priorities. "American consumers who shop at places that import, like Walmart and Target, pay for the wall, making it a regressive tax supporting a dumb, wasteful idea." Spicer’s comments appeared to move the president closer to embracing a “border adjusted” tax approach that House Republicans favor, Bernstein said. That plan would radically remake the U.S. corporate tax system to apply a 20 percent tax rate to companies’ domestic sales and imports, while not taxing their exports. It would apply to all imports, not just those from Mexico, and would generate roughly $1.1 trillion in revenue over a decade, according to an analysis by the conservative Tax Foundation. Currently, the U.S. taxes its corporations’ worldwide income at a 35 percent rate -- though they can use foreign tax credits to reduce that amount, and companies don’t have to pay any U.S. tax on overseas income until they bring it to the U.S. The border tax Trump floated would be a clear violation of NAFTA, which allows the duty-free movement of goods between Mexico, the U.S. and Canada, though Trump already has said he will demand a renegotiation of the deal or withdraw. Under existing treaties, Trump could impose 15 percent duties for 100 days on Mexican imports, claiming a “balance payments emergency,” but that would fall short of the punishment he’s threatened. Other fines, such as anti-dumping duties, require special and lengthy procedures to enact. For his tariff to stick, Trump would likely have to ask Congress to include it in a broader overhaul of the U.S. tax code. House Speaker Paul Ryan and Senate Majority Leader Mitch McConnell both suggested Thursday that, after months of studiously ignoring the border wall proposal, they’re now ready to act on the wall as part of a spending request they expect from Trump that would help jump-start construction. The two leaders said they’re ready to spend as much as $15 billion from the federal treasury to build the wall. Trump has repeatedly repeatedly about a 35 percent import tariff to force companies to produce U.S. market-sold products………in the U.S., rather than Mexico. Where did 20 percent come from ? Why is Trump going to give companies producing in Mexico for the U.S market a 15 percent discount ? President Donald Trump kept one of his major campaign promises on Monday when he withdrew the United States from the Trans-Pacific Partnership. The ramifications of Trump’s decision are worrisome and, whether or not the withdrawal helps American workers, it would be helpful to U.S. standing in the region if he communicated better, and to a larger audience, exactly what he’s trying to do. I have lived and worked in Asia for 25 years. Feelings of uncertainty about the United States right now are palpable. People want to know what’s going on. Trump was seated at his desk in the Oval Office on his first weekday as president. Behind him were Vice President Mike Pence and an entourage of advisors including Steve Bannon, Reince Priebus and Peter Navarro. Navarro’s presence seemed incongruous for a University of California economist whose fame comes from warning Americans about the menace China’s government poses to the United States’ well-being. The TPP’s standards on intellectual property protection, the environment and labor conditions effectively excluded China from joining the treaty because it would have made Chinese manufacturers spend what TPP members spend, something Beijing – always welcome to join – doesn’t want to see happen. Trump surely knows that with the United States out, the treaty might die – and with it this leveling of the playing field – a gift for Beijing. Problem is, nobody really does know what that means. Besides calling it “the death blow for American manufacturing” he hasn’t said much about what he else has in store now that the United States is out. And while there’s a lot of merit in the president’s seeming willingness to let Beijing do a little guesswork for a change, there’s not much merit in letting the other eleven countries in the TPP do the same. Some of the United States’ closest allies – Australia, Canada, Japan and New Zealand – are in the TPP, and all the others are friends. Even if one agrees with Trump’s decision to withdraw the United States from the TPP, there’s a lot of work to be done between now and the “great thing” arriving. Economists and the media have been insisting that jobs sent abroad aren’t coming home and, even if they did, robots would be doing most of them. There’s some truth in this. But I’d never bet against American business. As a retired private equity friend said to me recently, after complaining about his industry brethren who buy domestic businesses to send abroad to cash in on cheap labor, “We have to make stuff here.” He didn’t mean everything and he didn’t mean all of it, but the hollowing out of the U.S. manufacturing base so the private equity guys and their banker friends can get rich was never a good thing for the country. China might be able to make the world’s steel at the lowest cost, for example, but what government would cede this strategic industry to Beijing? If the right policies emerge from Washington as the Trump team fleshes out its trade and related policies – which can’t be simply increasing tariffs to keep the competition less competitive – expect American business to rise to the challenge. But they need to know what those policies are – uncertainty freezes business – and American allies and friends around the world do, too. Here’s what Trump should have said or, better, read from the written statement that wasn’t on his desk, because his audience isn’t hostile reporters, it’s the rest of the world. “Before I sign this, I’d like to say a few words. We recognize that our allies and close friends, with whom the last administration worked on the pact, are disappointed by our withdrawal from the TPP. International treaties like the TPP require ratification by our government, and we are not moving forward in no small part because the American people don’t like the TPP, and we can’t – I can’t – go ahead. It’s worth noting that my opponent was also against the TPP. “We are not abandoning the Pacific region. From Japan to Australia, to Chile, to Canada, and stops in between, we value our relations with all the TPP countries and will continue to expand our trade with them all. Making America great again does not, in any way, come at the expense of our friends and does not, in any way, mean backing away from our long-term commitments and friendships. The TPP doesn’t exist now, so trade tomorrow will be the same as trade today. “As I said many times, we like trade and are happy to trade, even with China. We just want the trade to be fair. Since Richard Nixon extended a hand of friendship to China and the economic help from trade that came with it, our position has always been one of fair play and mutual gain. No Chinese government has reciprocated. It’s time to change. Beijing doesn’t play by the rules that have helped its rich accumulate vast personal wealth at the expense of others, both inside and outside of China. We’re done being part of that. This is a regime that taxes our exports to them, bars some of our companies from entering, keeps entire sectors off limits to foreigners, and is making it increasingly difficult for foreigners who are there to do business. They want to buy our successful companies, especially in the technology sector and, recently, Hollywood, yet won’t allow foreigners to wholly own or even control companies in many industries and restrict or prohibit outright investment in dozens of other industries. That’s not a tweet, but it’s the message America’s allies and friends would like to hear directly from Trump. He hasn’t actually done anything that’s bad for global trade yet, except create a lot of uncertainty. Better communication from him can serve everyone well, and the sooner, the better. The heads of GE, Boeing and other large corporations have warned that the US may not have another opportunity to revamp its tax code for 30 years if it misses out on a chance to do so now amid uproar over a proposed import tax. In a letter to Congress, 16 CEOs from exporters including Caterpillar, Dow Chemical and Pfizer issued their strongest statements of support yet for the import tax, which retailers, oil refiners and other importers are fighting to kill. The import tax is the linchpin of a radical plan from Republicans in the House of Representatives to overhaul the tax code for the first time since 1986. But President Donald Trump has yet to say whether he will embrace it to fulfill his promise of tax reform. “If we miss this chance to fundamentally reshape the tax code, it might take another 30 years before we have another chance to try,” the CEOs wrote in a letter sent on Tuesday. The lobbying war between importers and exporters — whose products would go untaxed if shipped overseas under the plan — has already slowed the writing of legislation and prompted some senators to come out against the House plan. With some lobbyists now predicting the only viable reforms could comprise a modest rate cut and some streamlining, the CEOs wrote that “incremental tweaks will not level the playing field for American workers or dramatically reinvigorate economic growth”. Mr Trump had pinned his hopes on tax reform as a key tool for re-energizing business and the US economy but it has turned into one of several policy areas where progress has been scuppered either by Republican infighting or White House mis-steps. Retailers such as Walmart and Target, which depend heavily on imported goods, have formed a coalition to warn that the import tax would be a mortal threat to their businesses, leaving them with little choice but to raise prices for consumers. By taxing imports and exempting exports, the plan’s backers say it would bring the US into line with other countries that already levy value added tax* (VAT) on imported products but do not tax domestically made products on their way out. Some economists dispute the comparison, noting among other things that VAT is a consumption tax whereas the Republican proposal is a tax on businesses. A post-election rally in the US stock market was driven partly by hopes of tax reform because US companies — including those signing the letter — have long complained of an “antiquated” tax system that charges them the highest rates in the OECD. The letter was sent to Mr Ryan and Senate majority leader Mitch McConnell, another Republican, as well as to Nancy Pelosi and Chuck Schumer, the top Democrats in the House and Senate respectively. Other signatories are the chief executives of Celanese, Celgene, Eli Lilly, Merck, Oracle, Raytheon and United Technologies. * Value Added Tax (VAT) is a scam in Europe and elsewhere that resulting in high consumer prices. The U.S. trade deficit jumped in January to the highest level in nearly five years as a flood of mobile phones and other consumer products widened America's trade gap with China. The result underscores the challenges facing President Donald Trump in fulfilling a campaign pledge to reduce America's trade deficits. White House trade adviser Peter Navarro, a long-time critic of China's trade practices, told an economists' group on Monday that reducing America's trade deficits would deliver stronger economic growth and improve national security. Andrew Hunter, U.S. economist for Capital Economics, said that the big increase in the deficit in January likely signals that trade will drag overall growth in the first quarter. But he said the impact wouldn't be as severe as in the fourth quarter, when trade trimmed growth by 1.7 percentage points. And brighter days may be ahead. "With the headwind from the dollar's prior appreciation having eased and global growth picking up quite sharply, the outlook for exports is better now than it has been in some time," Hunter said. The Trump administration will seek modest — but numerous — changes to the North American Free Trade Agreement (NAFTA), according to a draft of a letter sent to Congress last week, displaying a much more conventional approach to trade negotiation than the dramatic changes President Trump had suggested he planned to seek. The draft letter suggests a much more diplomatic tone than Trump has threatened to use during NAFTA renegotiations. It says, among other things, that the White House would look to strengthen cooperation under the World Trade Organization (WTO), an international group that the Trump administration had suggested in the past it might not abide by. One section of the letter that is likely to prove controversial appears to call for restricting federal procurement to U.S. suppliers. If the two other countries adopted similar rules in response, U.S. firms that have contracts with Mexico City and Ottawa could lose business. NAFTA is a free-trade agreement that went into force in 1994 after the Clinton administration reached a deal with Canada and Mexico. NAFTA has significantly expanded trade between the three countries, but Democrats and Republicans have said the agreement should be changed because they fear it has hurt U.S. workers. Trump has complained that the deal has allowed Mexico to take advantage of the United States, causing an imbalance in the kinds of goods that are shipped across the border and luring away U.S. jobs. To renegotiate NAFTA, the White House must send a letter to Congress stating its intent, and the White House’s Office of the U.S. Trade Representative began circulating a letter last week. The White House must formally notify Congress 90 days before it formally begins renegotiating the trade agreement, and when the letter is formally sent to Capitol Hill, that process will start. “For reasons of scale alone, improving the NAFTA has the greatest potential to benefit the workers, farmers, and firms of the United States,” says the draft, which was signed by Stephen P. Vaughan, the acting U.S. trade representative. “Basically, in most areas, it’s very consistent with the trade negotiating strategies of past administrations,” Schott said. He added, though, that there are several lines in the letter that indicate departures from past policy. One of the objectives listed is to “seek to level the playing field on tax treatment,” which suggests duties on Canadian and Mexican products. During the campaign, Trump floated a tariff of as much as 35 percent on certain goods imported from Mexico. Another possibility is that if Republicans in Congress deliver on their proposal to adjust corporate taxes at the border, the administration's negotiators want to to make sure that Mexico and Canada are ready to accept the change. Other language in the letter suggests the administration is skeptical of a process for resolving disputes between governments and multinational firms that has been criticized by liberal figures including Sen. Elizabeth Warren (D-Ma. ), who say corporations have exploited the system at the expense of the public interest. Some on the right have objected to the process as well, arguing that it impinges on American sovereignty by giving international tribunals authority that would otherwise belong to U.S. courts. Yet the letter does not explicitly call for ending the process, known as investor-state dispute settlement. “They put a lot of code words in there about that, but there’s still some ambiguity,” Schott said. Another component of the letter appears related to an old dispute with Canada over softwood lumber. For more than three decades, U.S. loggers have argued that their Canadian competitors are receiving unfair advantages from the government, and the draft calls for eliminating a provision of NAFTA that Canadians could use to appeal any duties the United States imposes on Canadian softwood in retaliation. There were only a couple of passages in the letter that seemed reflected Trump’s stated policy of putting the interests of American workers first. One, Veroneau noted, was the section on “rules of origin,” which govern how much raw material from outside North America can be used in products that are manufactured in Canada, Mexico or the United States and sold under NAFTA’s favorable terms. The letter also calls for stronger intellectual-property rights and a commitment from Mexico and Canada not to impose customs duties on digital products. “NAFTA is the worst trade deal maybe ever,” Trump said in a debate with Democratic presidential nominee Hillary Clinton in September. "It's a defective agreement." Trump has said that if Mexico does not agree to the United States' demands in the renegotiations, he probably would withdraw from NAFTA. But the letter does not include this threat. “We are committed to concluding these negotiations with timely and substantive results for U.S. workers, consumers, businesses, farmers, and ranchers, keeping in mind U.S. priorities and negotiating objectives,” the draft letter says. Warnings of US protectionism by Christine Lagarde, head of the International Monetary Fund, and others are “rubbish”, Donald Trump’s top trade official has said in a new attack on the big trade surpluses of China, Europe and Japan. Speaking ahead of the arrival in Washington of global finance officials for this week’s International Monetary Fund (IMF) and World Bank spring meetings, commerce secretary Wilbur Ross said those accusing the Trump administration of protectionism were firing at the wrong target. The billionaire investor, who Trump has put in charge of trade policy and tasked with finding ways to reduce the US’s $500 billion trade deficit, said veiled criticism by Lagarde and other defenders of multilateralism about rising protectionism were clearly aimed at the new administration. His remarks came amid signs that Trump is beginning to adopt a more moderate tone on trade, choosing last week not to label China a currency manipulator despite campaign threats to do so. That has been taken as evidence by some that the internationalists within his White House, such as former Goldman Sachs executive Gary Cohn, are winning hard-fought policy battles against the economic nationalists. But Ross, who straddles the two camps, insisted that, despite any apparent softening, the Trump administration remained intent on pursuing its “America first” agenda while shaking up Washington’s global trading relationships. Ross also made clear it saw the Bretton Woods system as partly responsible for what it considers to be the unfair state of things. He accused Lagarde and other defenders of the current multilateral system of “sloganeering” of trying to preserve a system that had contributed to the ballooning of the US trade deficit since the 1970s. Lagarde, World Bank president Jim Yong Kim and others have stepped up their public defence of multilateralism since Trump’s election. In a speech last week Lagarde called for a defence of the “global economic and financial architecture” while warning that the “sword of protectionism” hung over the world economy. Their calls reflect what is likely to be one of the main themes at this week’s IMF and World Bank meetings in Washington. Trump and his aides have sought to placate allies at meetings such as last month’s gathering of G20 finance ministers in Germany by insisting that the US remains committed to international institutions. But the new US president has nominated conservatives who are skeptical of multilateral institutions for key posts and proposed big cuts to US funding for the United Nations, as well as a $750 million annual cut in contributions to the World Bank and regional development banks. Trump’s administration also has signalled that it plans to take a more skeptical approach to the World Trade Organization (WTO), and particularly its dispute system. The intervention came ahead of a visit to Japan this week by Ross and vice-president Mike Pence for talks aimed partly at convincing Tokyo to open negotiations over a bilateral trade deal following the US withdrawal from the 12-country Trans- Pacific Partnership (TPP). Their trip follows the announcement earlier this month of negotiations with Beijing to draft a plan to address the US’s trade deficit with China. It also comes as Ross is preparing to launch a renegotiation of the North American Free Trade Agreement (NAFTA) with Canada and Mexico. Ross said the “exploratory trip” to Japan was intended to see if Prime Minister Shinzo Abe, who visited the US in February, would agree on a “path forward” for a bilateral agreement. “The question will be whether they are ready to consider the concept,” he said. Ross acknowledged that Abe had expended significant political capital on the TPP but he derided efforts to revive the agreement. Any bilateral agreement with Japan would have to see Tokyo add to the concessions it made in the TPP, which he characterized as “minor gains” for the US in agriculture and intellectual property, and he said the US would not accept anything less. President Donald Trump won’t immediately terminate U.S. participation in the North American Free Trade Agreement, the White House said, after he spoke with the leaders of Mexico and Canada about ways to renegotiate the accord. “Both conversations were pleasant and productive. President Trump agreed not to terminate NAFTA at this time and the leaders agreed to proceed swiftly, according to their required internal procedures, to enable the renegotiation of the NAFTA deal to the benefit of all three countries," the White House said Wednesday. Mexico’s peso and Canada’s dollar jumped after the White House’s announcement. Trump’s top advisers had been embroiled in a debate over how aggressively to proceed on reshaping U.S. participation in NAFTA, with hard-liners favoring a threatened withdrawal as soon as this week and others advocating for a more measured approach to reopening negotiations with Canada and Mexico. Some of Trump’s advisers wanted a dramatic move before Trump’s 100th day in office on Saturday to fulfill a key campaign promise, while others said he could let the milestone pass and revisit the issue later through more formal procedures, according to two White House officials who spoke on condition of anonymity to discuss internal deliberations. The dispute played out in the media Wednesday, with several outlets saying Trump would take the most dramatic available step -- issuing an order declaring his intention to withdraw from the treaty. In this case, threatening to withdraw would have amounted to a formal step that started the process of giving Mexico and Canada six months notice that Trump intended to start negotiating. Instead Trump is asking the two other nations to open talks on ways to make the deal more balanced from the U.S. perspective, which is allowed within the framework of the treaty. He spoke late Wednesday afternoon with his two counterparts, Canadian Prime Minister Justin Trudeau and Mexican President Enrique Pena Nieto, according to the White House. Exactly who in the White House sparred over the decision wasn’t known but one of the most prominent anti-trade hard-liners is Senior Counselor to the President Steve Bannon, and Trump’s decision is sure to be viewed as a defeat for Bannon and his views. Bannon already is seen as being on the outs with Trump over reportedly sparring with Trump’s son-in-law Jared Kushner. Talk that Trump would revisit NAFTA on Wednesday had caused Mexico’s peso, the Canadian dollar and shares of companies that rely on cross-border trade to plunge. Trump must give Congress 90 days notice that he seeks to renegotiate the accord. Commerce Secretary Wilbur Ross said on Tuesday the administration is busy working with lawmakers to kick start renegotiation of the deal. He did say the U.S. was embarking on a more muscular strategy for trade-enforcement. Trump has blamed NAFTA for hollowing out America’s manufacturing sector by relocating jobs to lower-cost Mexico -- which his administration initially said was the main target of changes he was seeking to the accord. Where Trump stands on NAFTA is hard to discern. After harsh rhetoric during the campaign, he has in recent weeks toned down his criticism, suggesting the relationship with Canada only needs tweaking. But this week he fueled trade tensions by imposing new duties on softwood lumber imports from Canada and vowing to defend U.S. dairy farmers against quotas imposed in Canada. A number of Republicans are strong backers of free trade and have cautioned the administration against walking away from the free-trade deal. Without NAFTA -- which reduced or eliminated tariffs on most trade products after taking force in 1994 -- commerce ties between the nations would need to be reset, raising the specter of more frequent trade disputes and higher tariffs. U.S. trade with its NAFTA partners has more than tripled since the agreement took effect, rising to $1.1 trillion last year. Canada followed by Mexico ranked as the two biggest markets for U.S. exports, taking in a combined 34 percent of the total in 2016, according to a February paper published by the Congressional Research Service. From the moment he descended an escalator at TrumpTower almost two years ago and announced his presidential candidacy, Donald Trump has vowed to put the US back on a winning path in its trade dealings with China. “I beat China all the time. All the time,” he declared to cheers that day in June 2015. But did Mr Trump just get outplayed in his first trade negotiation with China? A deal announced on Friday by officials in Beijing and Washington was billed as “gigantic” and “Herculean” by his administration in its efforts to reset the relationship between the world’s two largest economies. It also marked a major de-escalation from Mr Trump’s bellicose campaign rhetoric and widespread fears that he might set off a trade war. To some former US officials, Trump advisers, business executives and other close watchers of the US-China relationship, however, this was a poor deal in which Beijing had simply reheated old promises. They say it raises questions about the Trump administration’s strategic wherewithal and the very negotiating muscle the president has so often touted. “They got played,” was the blunter assessment of one former US official. The “early harvest” deal rolled out on Friday saw China agree to resume imports of US beef that were suspended in 2003, in a move that US cattle ranchers hailed as “historic” but which Chinese leaders had already agreed to last September. Beijing also committed to open its market to foreign-owned credit rating agencies and credit card companies — a pledge that addressed long-running US gripes but also resembled previous promises. Ahead of China’s 2001 accession to the World Trade Organization (WTO), China had agreed to open credit cards — or the broader market for electronic payments made in renminbi — to foreign-owned companies such as Visa and MasterCard. For its part the US has agreed to encourage natural gas sales to Chinese buyers and opened the door to imports of cooked chicken from China. More importantly, the US offered its tacit endorsement for Beijing’s “Belt and Road” project to revive the ancient trade route to Europe by sending a delegation to a Beijing summit that started on Saturday. That move upended the arm’s-length approach of the Obama administration and left the Trump administration struggling to explain why it was embracing a project many see as Beijing’s latest effort to replace the US as a trading and military power in the Asia-Pacific region. According to the administration, the deal — part of a 100-day plan hatched by Mr Trump and Chinese president Xi Jinping during the Florida summit in April — will turn out to be the first of many. But critics say that in its impatience to get a deal done, the new US administration had given up many key points of leverage that would have been useful for future negotiations. Meanwhile, in the name of reducing a trade deficit with China worth more than $300 billion last year, the administration showed no signs of addressing bigger strategic economic issues such as Beijing’s efforts to force US companies to use Chinese technology or to buy US companies in key sectors. “There are a lot of major concerns about the way China is operating and the things that China does,” says US National Foreign Trade Council president Rufus Yerxa, pointing to Chinese restrictions on tech products and cloud computing. “It’s a bit concerning that those issues aren’t front and center,” he says. Mr DiMicco says that with its promise to sell more natural gas to China, the Trump administration risked undermining what is now an important competitive advantage for US industry — cheap energy costs — and the manufacturing renaissance it has promised. “When the gas exports [to China] get large enough, which they will, it will drive up natural gas prices for our domestic manufacturers, and negatively impact our reshoring efforts,” he says. HAWESVILLE, Kentucky — When Bill Hughes went to fight in Iraq in 2003, members of his Army unit lined their vehicles with scrap metal, sandbags and bulletproof vests to protect themselves from roadside bombs. By the time his younger brother Ryan Young was in Iraq in 2008, the vehicles were made of a high-purity aluminum alloy that was much more effective at absorbing the blast. Today, Hughes and Young work side by side here at the last U.S. smelter that makes the high-purity aluminum used in armored vehicles, sons of a region where jobs in the metal industry, ubiquitous for decades, have become a rapidly disappearing way of life. Hawesville’s Century Aluminum Co. plant constantly teeters on the edge of shutting down, typical in an industry where a glut of cheap metal from China has forced many plants to close. But hope came to Hawesville in April, when President Trump announced that his administration was considering restricting imports of foreign-forged aluminum in the name of national security, arguing that domestic plants needed to be protected to ensure that the country can make its own war machines. “When that come out, there was a buzz in the area. You could just see the excitement on people’s faces,” said Hughes, 34. A decision by the Trump administration to use national security to protect an industry would be among the most dramatic — and risky — moves in the president’s trade agenda, which seeks to limit what he regards as unfair foreign competition. While intervention could be a boon for Hawesville, it could raise prices for other customers and companies — including the federal government, which ultimately buys the armored vehicles and fighter jets made from the aluminum. And amid the debate over how far the government should go to protect certain industries in the era of global competition and technological change, some trade and industry experts are questioning whether the administration is simply using national security as an excuse for economic protectionism. The decision — based on a Commerce Department investigation — will come out in June, Trump said in a tweet Saturday night. “Will take more action if necessary,” he wrote. 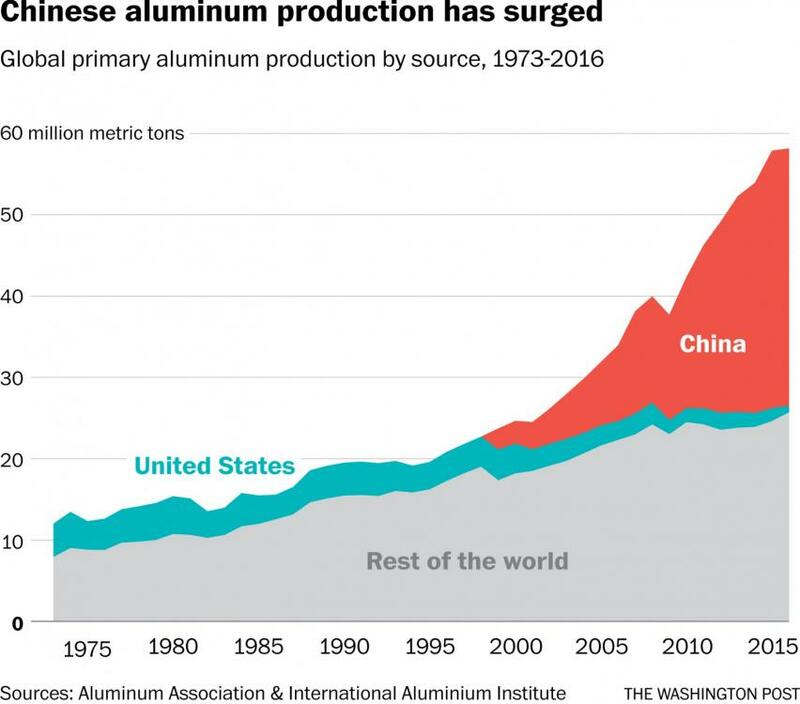 The debate over aluminum’s future in the United States comes after 20 years of China flooding the global market with the natural resource, depressing prices to a level where few U.S. companies can compete. 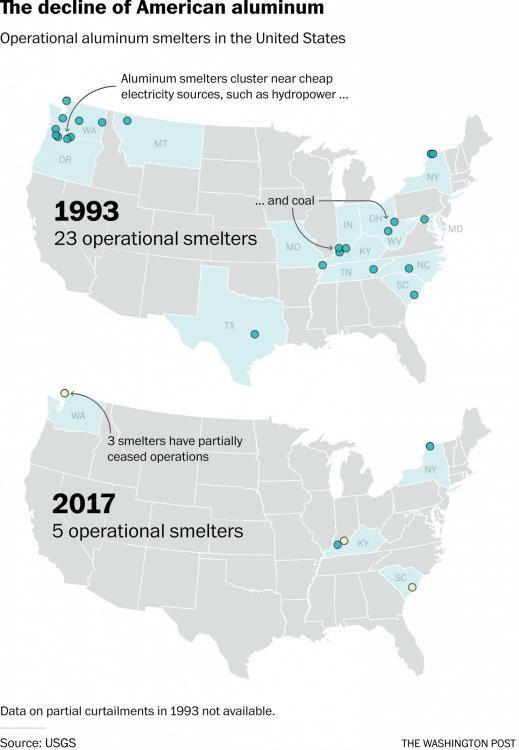 The United States has gone from having 23 operational aluminum smelters in 1993 to just five today, with only two running at full capacity. Over the last five years, Hawesville’s Century Aluminum has twice issued notices that it would shut down permanently in 60 days, before pulling its business back from the brink. It has laid off more than 300 people in just the last two years and has been scrapping unused machinery for extra cash. Another dip in global prices could shut its doors forever. The more than 200 jobs that remain, while they pay well for the area, are grueling ones, often 16 hours of physical labor in temperatures reaching 140 degrees. If the administration’s investigation finds that the country’s defense capabilities are being compromised by the decline of aluminum plants like the one in Hawesville, the president would have the power to impose tariffs or other restrictions on imports. Because it’s in the name of national security, Trump could circumvent a longer, more complicated process for changing trade policy at the World Trade Organization. The Obama administration filed a complaint about China’s aluminum industry at the WTO in January, but it has yet to deliver a ruling. Instead, the Trump administration has relied on a rarely used trade measure known as a Section 232 probe. The administration has also announced such a probe into steel. Yet any resulting action could have unintended consequences. Past administrations have used Section 232 sparingly, because of the concern that this exception to international trade guidelines might become the new rule. Others question whether the investigation is really motivated by security concerns, or whether it is a veiled effort to protect U.S. companies from foreign competition. Tom Leary, an analyst at the consulting firm Harbor Aluminum, said the United States has plenty of access to aluminum in Canada, a top ally from which the U.S. government already sources a lot of defense equipment. Chinese producers don’t directly export raw aluminum into the United States, so tariffs may have little effect on the country that many in the aluminum industry say is the real culprit. Chinese aluminum production has hurt U.S. producers by flooding global market and depressing prices everywhere. Chrystia Freeland, the foreign minister of Canada, said she had pressed Trump administration officials about the investigation’s potential effects. “It’s amazing and astonishing and absurd to me that Canada would be considered in that frame given our shared security interests,” she said in an interview. If the Trump administration chooses to restrict aluminum imports, that could keep the doors open for Century, which operates mostly in the United States, but it would raise costs for other businesses — like the industries that mix the metal into alloys, roll it out into long sheets or stamp it into automobiles and window frames. It could also mean higher costs for the ultimate buyer of American-made defense goods: the U.S. government, said Dan Stohr, a spokesman for the Aerospace Industries Association, a trade association for the defense industry. The national security is a wrinkle in a larger debate over manufacturing in America: whether the government should intervene to shelter a place like Hawesville from the winds of global trade. It’s a familiar topic here, where locals have been buffeted by forces beyond their control for decades. The Whirlpool factory moved its jobs to Mexico. A glut of Russian metal put the local steel mill out of business. Competition from China forced furniture factories to close. The community still has jobs, but it shows signs of wear. In Cannelton, Ind., across the Ohio River, shop windows are boarded up. At the Century plant, the jobs, already taxing, have become harder with cutbacks. Union members say that four employees now do the work that 10 once did. Overtime is common, with workers tending smoldering vats of molten metal for up to 16 hours a shift. Even though the factory is open to the breeze, the temperatures can climb to 140 degrees in the summer. Workers drink two or three gallons of water a day, and at the end of their shift they can wring the sweat from their clothes. Despite the grueling work, locals say these are good jobs that are worth protecting. Hughes and Young rely on them to raise four kids each. The average job at the Hawesville plant pays $23 an hour — $10 or more an hour than the jobs that their friends who have been laid off from the smelter have found in furniture factories, prisons and lawn care services. The difference, locals say, is affording three-bedroom house vs. being stuck in a trailer. 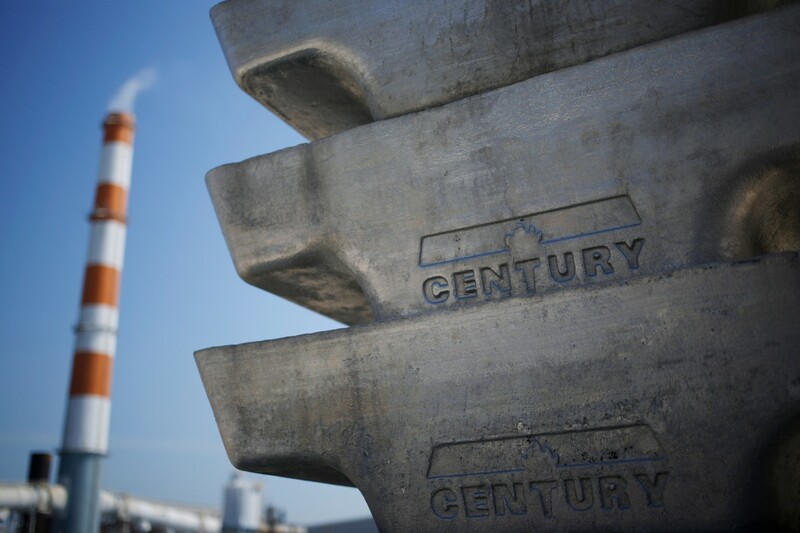 Before coming to Century Aluminum, Hughes and Young used to work across the river in Indiana at an iron foundry and then at an aluminum smelter owned by Alcoa. Young was at the Alcoa plant in January 2016 on the day it announced that it was closing its doors, laying him off and hundreds of others. He counts himself lucky to have found a job at Hawesville — and frets about what its potential closure could mean. Yet the forces buffeting Hawesville won’t be entirely mitigated even if Trump announces tough action to protect aluminum. 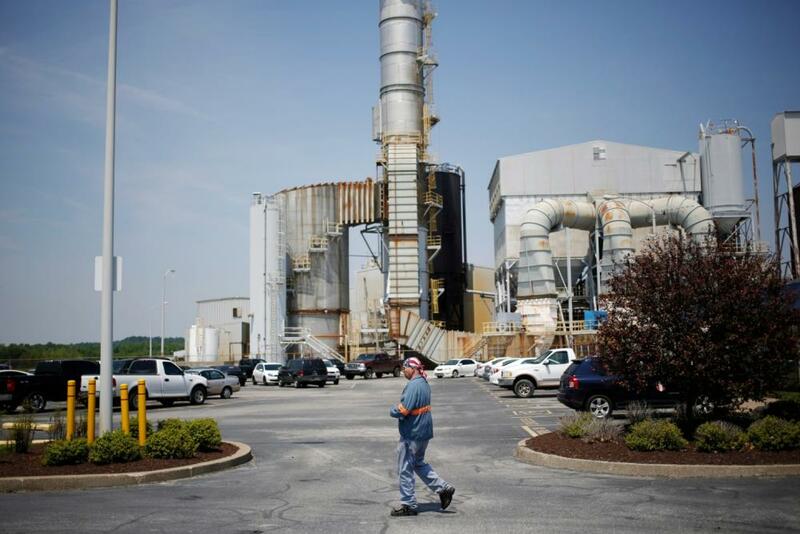 Locals say that, in addition to trade deals and the rise of China, part of the reason for job losses is the declining fortunes of coal, which is what brought the aluminum industry to Kentucky in the first place. To produce aluminum, smelters run a powerful electrical current through the raw material, alumina. When it was running at full capacity, the Hawesville plant used nearly 500 megawatts (MW) per hour, comparable to a city the size of Austin or Columbus, Ohio. Because the process is so energy-intensive, smelters tend to crop up in places with energy to spare — like the oil-rich Middle East or the geothermal hot spot of Iceland. But in the United States, changes in the economy have made aluminum smelting less viable. In Washington state, for instance, the smelters that used to operate near the hydroelectric power plants along the Columbia River have been priced out by the power-chugging server farms of tech companies such as Microsoft. As U.S. regulations on carbon-intensive coal electricity have gotten tougher, Hawesville’s rationale for aluminum began to fade. Young hopes smelting jobs survive in the Hawesville area, but he’s preparing in case they don’t. He said he’s going to preach to his kids that education is the only way to succeed. WASHINGTON -- U.S. Trade Representative Robert Lighthizer said on Wednesday there was no deadline for completing NAFTA trade talks between the U.S., Canada and Mexico even as lawmakers warned that U.S. business would be hurt by prolonged negotiations. "There is no deadline. My hope is that we can get it done by the end of the year, but there are a lot of people who think that is completely unrealistic," Lighthizer told a Senate Finance Committee hearing to discuss the USTR's budget. He said reaching a NAFTA deal by year-end was a "very, very quick timeframe (and) we're not going to have a bad agreement to save time." Under U.S. law, Lighthizer, a veteran trade lawyer, will be the principal U.S. negotiator on NAFTA, although U.S. Commerce Secretary Wilbur Ross will have a major role. The renegotiation of the 23-year-old NAFTA was a key campaign promise of U.S. President Donald Trump, who pledged to shrink trade deficits with other countries. While the talks are expected to begin in mid-August, Lighthizer said discussions were underway with Canada and Mexico to firm up a start date. "We are in the process right now talking to our negotiating partners about when the first day of the meeting will be," he added. A number of senators urged Lighthizer to avoid lengthy negotiations, which they warned would hurt sales by American businesses and farmers. Lighthizer was also pressed on the Trump administration's investigation into whether foreign steel and aluminum imports threaten U.S. national security. Findings of the investigations are expected by the end of June. U.S. Sen. Claire McCaskill, D-Mo., expressed concern that possible sweeping tariffs or quotas on steel and aluminum would impact American manufacturers. "I've got businesses in Missouri who use raw materials which aren't made in the United States and they are very worried about the impact a decision in this area will have on their costs of producing goods, but they are also worried about any other national security blockades," she said. Lighthizer said while steps were needed to crack down on foreign steel and aluminum flooding the American market, it was likely that an "exclusion process" would be introduced whereby U.S. businesses could apply to import products not made in the United States. "Situations where there are legitimate cases of a manufacturer who needs a steel product or aluminum product not made in the United States should go in and I think they will be accommodated. In most of those cases, it will be accommodated with an exclusion," he added. WASHINGTON -- The United States on Monday outlined a tough negotiating strategy for revising the 1994 North American Free Trade Agreement and for the first time in a U.S. trade deal said it would seek to deter currency manipulation by trading partners. In a much-anticipated document sent to lawmakers ahead of talks expected to begin next month, U.S. Trade Representative Robert Lighthizer said the Trump administration aimed to reduce the U.S. trade deficit by improving access for U.S. goods exported to Canada and Mexico, the two countries in NAFTA besides the United States. The document asserts that no country should manipulate currency exchange to gain an unfair competitive advantage. The 17-page summary of negotiations for NAFTA offers a glimpse into what a Trump administration trade agenda could look like. Until now, President Donald Trump's agenda has been shaped by campaign rhetoric and tweets. While Canada and Mexico are not considered currency manipulators, the reference in the list of objectives could set a template for future trade deals such as a pending negotiation to modify a five-year-old U.S.-South Korea free trade deal. South Korea is on a U.S. Treasury monitoring list for possible signs of currency manipulation. Among the priorities, Lighthizer said the administration would seek to eliminate a trade dispute mechanism that has largely prohibited the United States from pursuing anti-dumping and anti-subsidy cases against Canadian and Mexican firms. It also plans to eliminate a range of non-tariff barriers to U.S. agricultural exports to Canada and Mexico. These include subsidies and unfair pricing structures. The USTR said it would seek to strengthen NAFTA's rules of origin to ensure that the pact's benefits do not go to outside countries and to "incentivize" the sourcing of U.S. goods. It offered no details on such incentives and did not specify how much of a product's components must originate from within North America. The demands that the Trump administration makes in the NAFTA talks could have far-reaching implications for U.S. trade relations across the globe, with China eager to make inroads with Mexico and Canada if the United States is seen to be retreating. Lighthizer said the negotiations would begin no earlier than Aug. 16, 2017. U.S. labor union leaders and Democratic lawmakers weighed in on the issue early, reminding Trump they expect him to keep 2016 election campaign promises to protect American workers in NAFTA talks. They stopped short of demanding termination of the 1994 trade pact with Canada and Mexico. Richard Trumka, president of the AFL-CIO, an umbrella organization of unions representing 12.5 million workers, said NAFTA had been an "unequivocal failure" and should be completely renegotiated. "We will do everything we can to make this a good agreement and to hold the president at his word and make sure we get a renegotiation," he told a conference call with reporters. "If it comes out that it is not a good deal, no deal is better than a bad deal," Trumka said. NAFTA has quadrupled trade among the three countries, surpassing $1 trillion in 2015. Over a decade to 2010, however, the United States lost nearly 6 million manufacturing jobs. The U.S. trade balance with Mexico also swung from a small surplus in 1994 to deficits that have exceeded $60 billion for most of the past decade. OTTAWA -- The United States, Canada, and Mexico said on Tuesday they had made some progress in talks to modernize the NAFTA trade pact while acknowledging much work remained if they are to wrap the process up by the end of the year, as planned. Negotiators ended the third of seven rounds in Ottawa by saying they had substantially concluded one chapter, on small- and medium-sized enterprises. They also said they expected to wrap up work on competition issues before the next round in Washington from Oct 11-15. But the three teams did not dive into the details of the most sensitive matters and Mexican Economy Minister Ildefonso Guajardo told a news conference that there would be "substantial challenges" in the next round. Mexican and Canadian officials have already expressed concern that the United States has not yet presented details on some of the toughest issues, such as rules of origin which outlines how much of a product needs to originate in a NAFTA country. The talks are supposed to finish in December but trade experts say this is unlikely, given the complexity of some of the most contentious topics. "We never said this was going to be easy," Canadian Foreign Minister Chrystia Freeland told reporters at the end of the five-day session. The talks took place as Canada fumed over a U.S. decision to impose preliminary duties on Bombardier's CSeries jets, which is likely to add to trade tensions. The decision by the U.S. Commerce Department is likely to further harden Canada's stance on keeping a key dispute-settlement mechanism in the NAFTA, which the Trump administration wants to eliminate. Freeland raised the issue with U.S. Trade Representative Robert Lighthizer on Wednesday during NAFTA negotiations, Prime Minister Justin Trudeau told legislators. Freeland has suggested that Canada could walk away from the NAFTA talks over the so-called Chapter 19 dispute mechanism, under which binational panels make binding decisions on complaints about illegal subsidies and dumping. The United States has frequently lost such cases. A lengthy fight over Chapter 19 could drag out NAFTA negotiations beyond a planned end-December deadline to reach a deal ahead of Mexico's presidential election campaign. The U.S. delegation presented draft text on NAFTA labor standards on Tuesday and put forward proposals on investment and intellectual property at the weekend. Laxer labor standards and lower pay in Mexico have swelled corporate profits at the expense of Canadian and U.S. workers, making the issue one of the major battlegrounds of the NAFTA talks. WASHINGTON -- The U.S. Chamber of Commerce is sounding alarm bells about the need to preserve the North American Free Trade Agreement amid reports the Trump administration plans to stake out hard-line positions that could be deal breakers during the fourth round of negotiations scheduled to begin here Oct. 11. In a speech before business leaders in Mexico City on Tuesday, Chamber President Thomas Donohue called the U.S. proposals "poison pills" that would force Mexico and Canada to leave the talks and ultimately lead President Donald Trump to try and withdraw from NAFTA. "If the administration issued a withdrawal order -- which requires a six-month waiting period -- it would not be viewed by our partners ... as a negotiating tactic. Instead, it would abruptly slam the door on future negotiations because those governments have made it very clear they won't negotiate with a gun to their head. "The United States could then reasonably expect trade retaliation … higher tariffs … broken supply chains … and potentially less cooperation on other priorities like anti-terrorism and anti-narcotics efforts. And who would be hurt the most as a result? The very Americans that this administration seeks to put first," Donohue said at the annual U.S.-Mexico CEO Dialogue, according to a copy of his prepared remarks. The primary concern of automakers is what happens with rules of origin, which dictate whether goods imported from a partner nation qualify for duty-free status. The Trump administration is reportedly demanding a regional content value of 85 percent for automobiles and auto parts, up from 62.5 percent, with a new condition that half the content be produced in the United States. Automakers have fought to maintain the current content requirement for finished vehicles because some parts are sourced globally to control costs. Mexico and Canada have expressed some flexibility on the issue, but said a U.S. minimum content requirement is a nonstarter. U.S. negotiators are also pushing Mexican and Canadian red lines with proposals designed to give U.S. companies more opportunities for government contracts, as well as eliminate the use of neutral arbitration panels to settle trade disputes. The business community is also worried about a proposal for a five-year sunset provision unless all sides agree to an extension. Donohue said a termination trigger would undermine investment in all three nations because businesses would fear the uncertainty. Trump initiated the NAFTA renegotiation early this year on grounds it has led to massive outsourcing that has claimed U.S. jobs and economic opportunity. Administration officials have played up the $57 billion goods deficit with Mexico, including $68 billion for the auto sector, as the primary problem with NAFTA. But experts argue that deficits aren't an accurate way to measure benefits of a relationship that has created an integrated North American economy with improved living standards for many people. Last month, the Commerce Department released a study aimed at bolstering its case for tougher rules of origin. It showed that U.S. value-added content for automotive import from Canada and Mexico is declining, while non-NAFTA content is increasing, but Mexican officials have disputed the figures. The proposed changes to rules of origin appear more like political rhetoric than a serious solution because there is no evidence that U.S. trade officials have put in the legwork to understand how higher content values would impact trade flows, jobs and economic growth, Doreen Edelman, co-chair of the global business team at law firm Baker Donelson, said in an interview. The original NAFTA agreement took a lot of time and work by professional staff to reach the 62.5 percent content threshold "and I think it's unlikely they've put together a detailed proposal," she said. "They have to work with industry tariff line by tariff line to figure out what is feasible, otherwise it will throw the entire supply chain out of whack," Edelman said. If NAFTA disappears, she warned, manufacturers eventually might double down on investment in Canada and Mexico, as those countries expand free trade agreements around the world while the U.S. pulls back from existing deals. Donohue urged pro-trade lawmakers "to steel their resolve for what could be a big fight." The powerful business federation is working to demonstrate broad support for NAFTA by sending scores of members who have flown in town up to Capitol Hill on Wednesday to lobby lawmakers. The Chamber also sent a letter to Trump and members of Congress from 310 state and local chambers supporting a modernized NAFTA that preserves existing benefits. WASHINGTON -- President Donald Trump said on Wednesday he would be open to a bilateral trade pact with Canada if a deal cannot be reached with Mexico to substantially revise the North American Free Trade Agreement. Asked by a reporter if he could envision maintaining free trade with Canada if NAFTA talks sour with Mexico, Trump said: "Oh sure, absolutely. It's possible we won't be able to reach a deal with one or the other, but in the meantime we'll make a deal with one." He spoke at the White House alongside Canadian Prime Minister Justin Trudeau, on a visit to try to convince the U.S. leader of NAFTA's merits as a new round of renegotiations began near Washington. Asked about Trump's comments at a news conference later, Trudeau said he was still optimistic about the chances of modernizing the 1994 trade pact. "I continue to believe in NAFTA ... so saying, we are ready for anything, and we will continue to work diligently to protect Canadian interests,” Trudeau said. Trudeau also said that Canada was well aware of Trump's unpredictability. "That is certainly something that we are very much aware of and very braced for and conscious of but at the same time, Canadians expect us to work in a thoughtful meaningful way towards getting a good deal." The U.S. Chamber of Commerce on Tuesday accused Trump's administration of trying to sabotage the talks with "poison pill proposals," including demands for more favorable treatment for the U.S. side on car production, and a "sunset clause" to force regular negotiations. In his appearance with Trudeau, Trump said "we'll see what happens" when asked whether NAFTA was doomed. "It's possible we won't be able to make a deal, and it's possible that we will," he said. "We'll see if we can do the kind of changes that we need. We have to protect our workers, and in all fairness, the prime minister wants to protect Canada and his people also." U.S. Commerce Secretary Wilbur Ross, one of Trump's top trade advisers, downplayed the chances that a NAFTA termination would become necessary. "We don't hope it will, we don't desire that it will, we don't believe that it will, but it is at least a conceptual possibility as we go forward," Ross said. But U.S. and Mexican corporate chief executives gathered in Mexico City said they would be better off with no NAFTA than be saddled with a "bad agreement." Trade experts say the NAFTA talks are likely to stall in the face of aggressive U.S. attempts to sharply increase content requirements for autos and auto parts. People briefed on U.S. proposals to be presented this week said Washington is seeking to sharply lift North American content threshold in light-vehicle manufacturing. The proposals call for North American content overall to rise to 85 percent from the current 62.5 percent. In addition, the United States wants to add a new 50-percent U.S.-specific content requirement, something that was not in the earlier agreements. "These will be met with widespread opposition from Canada and Mexico. I think it's just a bridge too far," said Wendy Cutler, the Asia Society's Washington policy director and former chief U.S. negotiator for the Trans-Pacific Partnership trade deal canceled by Trump. The U.S. side sees strengthening the rules of origin for the auto industry as a way to bring back some auto parts production, including electronics, from Asia. But Mexico strongly opposes a U.S.-specific content requirement, which would limit the growth of its own auto industry. The difficult issue of rules of origin will be addressed mostly at the end of the current talks, according to a schedule obtained by Reuters. The negotiations were extended on Wednesday by two days to Oct 17. Other U.S. proposals opposed by Canada, Mexico and U.S. business interests include the five-year sunset provision, radical changes to NAFTA's dispute arbitration systems, changes to intellectual property provisions and new protections for U.S. seasonal produce growers. U.S. Trade Representative Robert Lighthizer said on Wednesday the three nations had completed their negotiations on company competition policy, reaching an agreement that goes beyond previous U.S. trade deals to ensure "certain rights and transparency under each nation's competition laws." WASHINGTON -- The United States on Friday unveiled hotly contested proposals for higher regional autos content in the North American Free Trade Agreement, three sources said, casting further doubt on the chances of reaching a deal to modernize the pact. Washington made its move a day after insisting that NAFTA contain a sunset clause that could mean the deal expires in five years. Canada and Mexico, the two other members of the pact, strongly oppose both ideas. A Mexican source with direct knowledge of the talks called the auto content proposal "absurd." Sources familiar with the talks say the mood is bad and question whether the negotiations can be wrapped up by the end of the year as planned. President Donald Trump, who complains that NAFTA has been a disaster for the United States, is threatening to walk away from the deal unless major changes are made. The U.S. side made its auto proposal during the fourth of seven planned rounds of talks on the treaty. Ensuring that autos need more regional content to qualify for NAFTA tariff-free access is one of the Trump administration's key demands. Canada and Mexico say such a move would disrupt the highly integrated continental auto industry. One of the sources said the United States wants to increase the North American content requirement for trucks, autos and large engines to 85 percent from 62.5 percent. Furthermore, Washington insists 50 percent of content must be U.S.-made. Trump administration officials say current content rules are too lax and have allowed auto companies to bring in too many cheap parts from China and other low-wage Asian countries. They are also seeking to halt the migration of vehicle production and manufacturing jobs to Mexico from the United States. Auto industry groups say substantially increasing local content requirements would raise costs, hurt regional competitiveness and cause many companies to forego NAFTA's benefits and simply pay the 2.5 percent U.S. tariff for imported cars and many parts. Trump has made no secret that he prefers bilateral trade deals, and skeptics wonder whether the U.S. demands are part of a strategy designed to ensure the current talks fail. The U.S. Chamber of Commerce had listed the U.S. autos demands among a number of "poison pill" proposals that it said would torpedo the talks. Canadian Prime Minister Justin Trudeau met Mexican President Enrique Pena Nieto on Thursday for talks, and later said Canada would not walk away from the table. Both men said they were committed to a "win-win-win" deal. Canadian officials say it is too soon to write off the talks. U.S. Trade Representative Robert Lighthizer, Canadian Foreign Minister Chrystia Freeland and Mexican Economy Minister Ildefonso Guajardo are due to meet in Washington on Tuesday to take stock of the negotiations. Other people briefed on the talks told Reuters that the U.S. autos proposal would require automakers to verify the use of North American steel, aluminum, copper and plastic resins in their vehicles. A spokeswoman for Lighthizer declined to comment. Canadian and Mexican government officials were not immediately available for comment. WASHINGTON -- Talks to renegotiate the North American Free Trade Agreement have bogged down over controversial U.S. proposals, with Canada and Mexico blaming the U.S. for trying to protect its market at the expense of the regional economy and the U.S. pointing the finger at its partners for unwillingness to correct a large trade imbalance. The acrimony between the sides was evident during a formal event for trade ministers to update the press about progress made so far. Typically during such ceremonies, officials play down differences and use diplomatic language to characterize their partners and the status of the talks. Instead, the ministers took shots at each side for what they saw as intransigence. "We have seen a series of unconventional proposals in critical areas that make our work much more challenging," Canadian Foreign Affairs Minister Chrystia Freeland said. "We have seen proposals that would turn back the clock on 23 years of predictability, openness and collaboration. In some cases, these proposals run counter to World Trade Organization rules. This is troubling." As the differences widened, the parties announced that the talks will extend into the first quarter of 2018. Earlier, they insisted they could conclude a deal by year end to avoid political complications from elections next year in Mexico and the U.S. that could make compromise more difficult. Many believed the original timetable was unrealistic given that trade deals are enormously complicated processes and that several major disagreements would not be resolved quickly. Canadian and Mexican officials characterized NAFTA as setting a stable framework for trade and investment over the past 23 years, while the U.S. administration says the benefits haven't been equitably shared. U.S. proposals that are causing anxiety for Canada, Mexico and much of the business community would significantly raise regional content requirements for autos and auto parts, with a separate requirement for domestic U.S. content; eliminate a dispute settlement mechanism for unfair trade practices; limit Canadian and Mexican companies' ability to bid for U.S. government contracts; and institute a sunset provision that would subject the agreement to a renewal process every five years. President Donald Trump has castigated NAFTA for encouraging U.S. manufacturers to outsource production to Mexico to save on labor costs, at the expense of U.S. workers. The administration says it wants to reverse a $60 billion trade deficit with Mexico, but supporters say NAFTA has integrated the three economies in ways that make North America a competitive manufacturing platform relative to Asia and Europe. Freeland accused the U.S. of a "winner-take-all mindset" that "seeks to undermine NAFTA," adding that U.S. proposals on rules of origin would be especially harmful to the auto industry. "The proposed U.S. national content requirements would severely disrupt these supply chains, making North American producers and manufacturers less competitive relative to imports from outside the region," she said. She noted that trade deficits aren't a good way to measure the benefits of trade deals, but noted that the U.S. enjoys an $8 billion trade surplus with Canada and a $36 billion surplus in manufacturing in a relationship that generates $634 billion in two-way annual trade. In a separate briefing, Mexican Economy Secretary Ildefonso Guajardo said, "It is a waste of time trying to design policy tools that will try to move 1,000 jobs from here to there." All sides would be better off creating a system that addresses how automation will change the work force of the future, he said. He also declared that the sunset provision is "completely unacceptable, because that establishes a sudden death every five years in which no investor would risk his or her capital." Negotiators said they have reached agreement on chapters involving competition while also making progress on customs streamlining and other areas. But U.S. Trade Representative Robert Lighthizer criticized Canada and Mexico for foot-dragging and not accepting the U.S. position on reversing its trade deficit. “We have seen no indication that our partners are willing to make any changes that will result in a rebalancing and a reduction in these huge trade deficits. Now I understand that after many years of one-sided benefits, their companies have become reliant on special preferences and not just comparative advantage,” he said. “Continuing to design a national manufacturing policy that is largely dependent on exports to the United States without balance cannot long continue. It is important also to remember that to some extent, NAFTA is an investment agreement, and it is unreasonable to expect that the United States will continue to encourage and guarantee U.S. companies to invest in Mexico and Canada primarily for export to the United States. “All parties must understand this and be reasonable if there is any chance for these negotiations to be successful,” Lighthizer said. He also complained that more progress had not been made on subjects such as digital trade and telecommunications, saying that Mexico and Canada are rejecting proposals that they already agreed to as part of the 12-nation Trans-Pacific Partnership agreement that President Trump scuttled in January. MEXICO CITY -- The Mexican Auto Industry Association on Thursday rejected U.S. proposals to increase North American content for autos produced in the region and require, under a new NAFTA deal, that half of all content come from the United States. AMIA President Eduardo Solis said the rules of origin enshrined in the current North American Free Trade Agreement have been key in creating value and integrating the auto industries of Canada, the United States and Mexico. "Our position is to not touch the methodology or the rules of origin that have allowed this sector to be successful in the three countries," Solis said at an event in Mexico City. U.S. President Donald Trump has proposed raising the amount of NAFTA content in autos to 85 percent and securing 50 percent of the total for the United States. Those demands to reserve the lion's share of automotive manufacturing for the United States helped cast a pall over a fourth round of talks to revamp the 23-year-old accord underpinning $1.2 trillion in annual trilateral trade. Global automakers including General Motors, Ford Motor Co., Fiat Chrysler Automobiles and Volkswagen AG all have plants in low-cost Mexico. U.S. NAFTA proposals: Going over like a lead balloon? Some of the hardline proposals made by the U.S. are clearly not well received by Canada and Mexico, and few now expect NAFTA 2.0 to remain on the fast track. In his closing statement, U.S. Trade Representative Robert Lighthizer firmly clarified President Trump’s objective to rebalance the $500 billion trade deficit. Lighthizer said he was surprised and disappointed by the resistance to change. Mexico will host the fifth round of talks in Mexico City from November 17-21, 2017. Additional negotiating rounds will be scheduled through the first quarter of 2018. The U.S. has proposed another difficult change to the North American Free Trade Agreement (NAFTA) that could eventually prevent long-haul Mexican truckers from operating in the country. American negotiators have asked to remove Mexico’s long-haul industry from a NAFTA chapter on cross-border services. That could open the door to restrictions on truckers, as losing NAFTA trade protections and advantages would make it harder for Mexico to challenge any future U.S. requirements on trucks such as new safety checks. A government official described it as a broad industry exclusion that came during the last round of talks in October. The U.S. Trade Representative’s office refused to comment, and hasn’t made its proposals public. Reuters also reported last month that the U.S. was seeking fresh restrictions on long-haul trucks from Mexico. The U.S. for years after NAFTA came into effect resisted giving Mexican truckers the right to operate throughout the country. They were limited to bringing loads a short distance into the U.S., where they would be transferred to American outfits for final delivery. A dispute resolution panel backed Mexico on the matter in 2001, though the U.S. didn’t comply for years. Mexico at one point imposed tariffs in retaliation. It wasn’t until 2015 that the U.S. gave licensed Mexican truckers the right to haul cargo throughout the nation. The U.S. proposal to exclude Mexican trucking adds to a list of contentious demands that President Donald Trump’s team has signaled must be met to keep the 1994 pact alive. The U.S. has also asked to scrap a dispute mechanism that is essential to Canada, the third party to NAFTA, and to tighten local content rules for cars. Negotiators have already said they will extend talks through March 2018, which is longer than originally anticipated and could bring the issue into Mexico’s presidential campaign season and U.S. congressional elections. The next round of discussions is in Mexico City this month. Mexico’s government opposes the new proposal on trucking, seeing it as a rollback of the rights won in the previous cross-border trucking dispute settlement, according to a person familiar with the position. Mexican Economy Minister Ildefonso Guajardo has said the government opposes anything that would weaken current market access under NAFTA. “It’s not surprising that this is being discussed, especially in view of the history of Washington’s policy approach toward Mexican trucks crossing the border,” said Stephen Laskowski, president of the Canadian Trucking Alliance, or CTA. Laskowski said he hasn’t seen a specific proposal on the matter, and the trucking industries in all three nations are working together to see NAFTA improved. The American Trucking Associations, in a joint statement last month with the CTA and Mexico’s main trucking lobby group, said that NAFTA benefits the three countries. On the other side of the debate, the International Brotherhood of Teamsters, a labor union, argues cross-border trucking takes away American jobs and creates safety risks. Teamsters President Jim Hoffa suggested the U.S. was backing his view during the last round of talks. “The Teamsters and our allies among independent truckers and highway safety advocates will be pleased with the U.S. position on cross-border services,” he said in a statement in mid-October.